This fierce clash of knights, facing each other three to the white and another with a gun, while two horses are lying on the ground, with one of the knights who tries to break free from the body of his horse and another rising, which attacks the opponent with a dagger, riding a white horse, who is preparing to strike him with the sword, is a significant new contribution to the catalogue of Cerquozzi "battaglista". A corpus still small compared to its fame in life, especially related to this specialization, as evidenced directly by his nickname of "Michelangelo delle Battaglie", which he wanted to be reminded in his testament that says "celeberrimus ille proeliorum Pictor Romanus". A credit, also specifically mentioned by the ancient biographers Passeri and Baldinucci, and that he had enlarged throughout Italy, if the Marshal J. M. Van der Schulenburg already in 1738 had as many as 22 paintings by Michelangelo, including "battles" and "bambocciate". But despite this, its prolific production of certain specific, in my exhaustive publication of 1999 (pp. 278-291, figs. 1-25, pp. 75-79, plates I- VII in color) I could not make many new contributions to the catalogue compiled by L. Laureati in his useful article (Michelangelo delle Battaglie, in "Paragone" nn: 523-525, 1993, p. 52-67) dedicated to Cerquozzi "battaglista", which will contain 17 "battles" or "scenes of war". In this work the epicenter of the "battle" is only mentioned in the background, not coincidentally two of the riders wear clothes rural and certainly not of militia officers, like their opponents, which could take place at the time of travel routes less frequented. The Cerquozzi describes this "clash" with raw immediacy and realism, just showing the everyday life, enhancing the burning vehemence of the combatants with appropriate types and dynamics with an expressive emotional and engaging. These peculiarities, together with his incisive brevity, will put a full stop in the evolution of modern of its kind, and was collected at a profit by the following disciples, first of all the Borgognone, which can be considered the ideal successor of Michelangelo, in the role of founder of the sector. 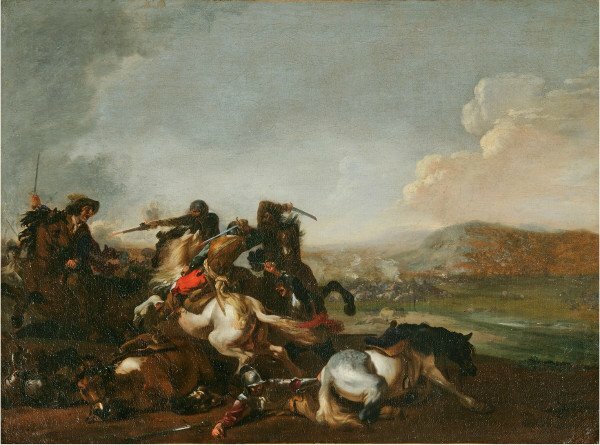 There are several stringent comparisons that can be analyzed, both analytical and general, with this "Battle", from the paintings in the Pinacoteca di Lucca to that outlined in the last exhibition held at Villa d'Este in Tivoli, where we find the same horse white, cut down to the ground, in a mirror image.